You can probably guess what Florida is famous for but the easy answer is beaches. And theme parks. Florida was admitted into the Union in 1845 and since then has developed a unique and fascinating history for itself. It’s more than beaches and theme parks. It was the site of many armed conflicts, famous inventions and other historically significant happenings. Here are the top 15 historical sites in Florida. A fancy name for the one-time Spanish fort that was also occupied by Great Britain, the Confederate States of America, and the U.S. itself. You can’t get much older than this in Florida (with the exception of the dinosaurs and maybe alligators). Made of coquina, it was built in 1672 and is the oldest masonry fort in the continental U.S. It’s a national monument and well worth the trip for all ages and anyone with even a remote interest in history. 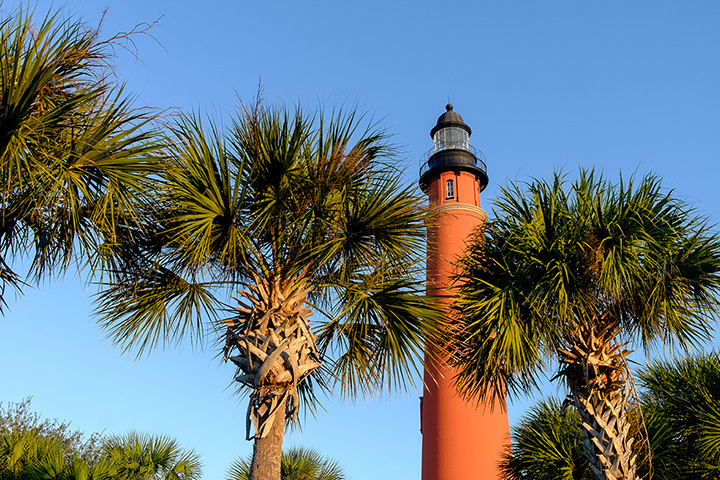 This is the tallest lighthouse in Florida at 175 feet, and among the tallest in the country. That distinction alone makes it worth the view. But for literary lowers, it has a far more important significance. Stephen Crane’s immortal story “The Open Boat” was based on the writer’s own experience as a seaman when his ship sank in heavy seas, and he joined three other sailors on a lifeboat a dozen miles off the coast of Daytona Beach. This spot hosts usual state park activities but is also a true historical site for many reasons, including black history. Louise Pacheco, a black slave and interpreter for Major Francis L. Dade, was one of only four survivors of the Dade massacre. The 1835 battle marked the beginning of the Second Seminole War. It turned out to be the longest and most costly of the various Seminole Indian wars in Florida. History lovers gather every January for a commemoration of the battle. There’s not a lot to see here due to its size, but this tiny wooden structure dates back to the early 18th century (at least as far back as 1716). Entirely hand-made, of course, of bald cypress and red cedar logs bound by iron pegs. This school house offers a look back at the daily life of colonial school children. This spot is a highly-rated historic place to visit by TripAdvisor and other sites. The beautiful historic place is Jacksonville's oldest residential home and Florida's last still-standing plantation home, according to tourism officials. You can tour on your own to take guided tours to see slave quarters and other elements of a historic Florida house. The World’s largest naval aviation museum and one of the most-visited in Florida. More than 150 restored airplanes from the U.S. Navy, Marine Corps and Coast Guard Aviation. Many planes are not only rare but also historic such as the NC-4, the first plane to cross the Atlantic by air. Pensacola has a long military history. This is one of the many memorials to it: a burial ground for sailors that dates back to the 1800s. More than 36,000 military veterans are buried here, along with several Medal of Honor recipients. Some of the older graves were men who fought the British during the war of 1812. Other stones were for men who fought against pirates in the Caribbean. He was a young doctor in the early 1800s whose name is often forgotten today. But John Gorrie was trying to cool the hot rooms of yellow fever patients when he basically invented air conditioning. He invented a machine that made ice in 1851. A replica is on display here. Today, his widely adopted invention is credited with bringing modern civilization to temperate climates. Like Florida, of course. A small city where it is said you can visit Greece in Florida. At one time, it was said to have more Greeks than any place of its size anywhere. The historic town near Clearwater was incorporated as a city in 1887. It has long been famous for its sponge docks (with a vast variety of bath and other products on sale everywhere), and its many down-home restaurants. Visitors also find museums and many monuments to the Tarpon, a famous fish in these Gulf waters. One of the most beloved writers of any time lived and worked in this old Florida home and farm in the 1930s. A ranger in period costume tells how “The Yearling” was conceived (and won the Pulitzer Prize, endearing itself to both young and old audiences in the book and several movie versions). While here, you can also pick up a copy of the book at this National Historic Landmark. Remember it’s educational but the kids (adults too) will love the exact copy of “Old Sparky,” the famous electric chair, and the 1862 replica of a Gatling gun. Knife pistols, cane guns and other seldom-seen weapons are available to view. There are also many military exhibits. Museum officials say they are believed to be the only combined military and police museum in the United States. No one has said whether the electric chair actually is operational but the Gatling gun is a working model. Not much more than a 40-foot limestone chimney and iron gates are what’s left from a once-thriving, 5,000-plus-acre site of a sugar plantation. It dates back to American Civil War times, when it supplied sugar products to southern troops. The owner was David Yulee, whose famous name has lent itself to many places throughout the state. This much-praised 2,000-seat church was a modern day testament to the area’s becoming the tourist capital of the world. In a way, it reflects the state’s modern-day tourist appeal. The church is known for its beautiful stained glass windows and handsome design. An Orlando priest visiting Lourdes in the 1970s had the dream of building a church to serve the millions of visitors to the area’s popular theme parks. His dream became reality after millions of dollars were raised to build the church, which is not only a place of worship but also, ironically, a popular tourist spot. View more Florida Historical Sites.